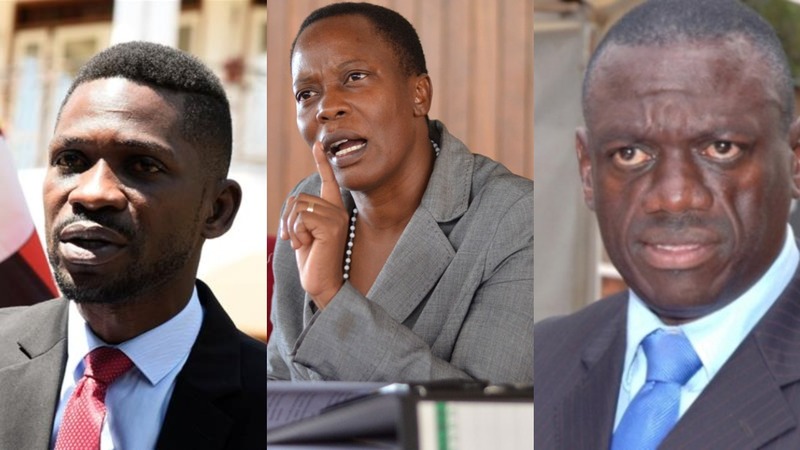 KAMPALA – Outspoken Mukono Municipality MP Betty Nambooze has dismissed claims that Kyadondo East MP Robert Kyagulanyi aka Bobi Wine is a competitor to Opposition lynchpin Kizza Besigye in the quest to dislodge President Museveni from power. Bobi Wine under his People Power slogan has taken the country by storm and caused ripples in the ruling party, with many analysts seeing the 36-year-old musician as the next biggest threat to Museveni’s 32 years in power. However, Nambooze said Bobi Wine has only served to energise the Opposition and that he and Besigye are constantly in touch as they work towards dislodging the ruling NRM party from power. “Has Kizza Besigye ever been a competitor Hon. Kyagulanyi? We have been set up as opposition. Have they ever competed in the same constituency? I feel energized by Hon. Kyagulanyi. I know Hon. Kyagulanyi and Kizza Besigye and I know they meet frequently. If we looking at 2021, it is not a sure year. No one knows if we shall have elections,” she said. The legislator was appearing on NBS TV’s breakfast show on Wednesday. She also insisted that the People Power and its red colour symbol are a tool that unites the Opposition in the country and should not be seen as only left for Bobi Wine. “Who was the first politician to be seen in Parliament putting on red? This colour came from Parliament and I was the first person to be seen in Parliament putting on red. It is our colour of unity demonstrated during the “Togikwatako” time. People Power is a phrase that shows our commitment to respect article 1 of the constitution that shows that power belongs to the people. We rather get something that unites us as opposition even if that is people power,” Nambooze said. The MP also said that the Opposition in Uganda has managed to overshadow the ruling NRM party, leaving only Museveni, whom she said will also soon be defeated. “The opposition against President Kaguta Museveni has gone. The party called NRM perished. That is one achievement of the opposition. We have been able to do away with NRM,” she said. Nambooze also dismissed allegations that some opposition MPs have refused to serve in the Shadow Cabinet that has appointed by the Leader of the Opposition in Parliament, Betty Aol Achan. “Why would anyone refuse to serve under Hon. Betty Achan? We are a group of equals in Parliament. The shadow cabinet is the only legal platform that unites the opposition. I pity those people who are celebrating that opposition has reached a dead end. 2018 has been another fine mess. We have lived a hangover of 2017 when we lost it all by forcefully amending the constitution. Ugandans are still mourning the loss of the achievement we had gotten in 1995. No one can tell you where Uganda is heading in all spheres of life,” she said.